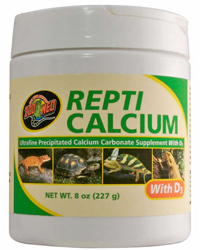 Repti Calcium is an ultra fine Precipitated Calcium Carbonate Supplement with Vitamin D3. It is a phosphorus-free calcium supplement for reptiles and amphibians. It has a unique shape/high surface area per gram resulting in increased calcium bioavailability.